If you or a family member (aged 18 or over) are struggling with the effects of diagnosis, illness or treatment - please call us or drop in – we’re here to help. Our service is open to anyone over the age of 18 who lives in Trafford or who has a Trafford GP. A member of our friendly team is always available to welcome and support you. The Centre is excellent. When you walk through the doors you can feel the calm and everyone always has a smile. From the bottom of my heart thank you to each and every one of you. As soon as you walk into the Centre you can feel the calming and peaceful atmosphere. Everyone was very helpful, compassionate and supportive and I felt that I could have approached any of the staff for help or advice. Thank you for giving me the opportunity to have had the benefit of the Centre’s help and support. I feel the Centre does a wonderful job in meeting the needs of anyone going through a very difficult time, and I can only express my thanks to everyone concerned. I found the Centre most helpful in coping with the problems around my husbands illness. I would just like to say many thanks for all the help you have given me and my family. I was very pleased with the way I was welcomed. Made to feel that I counted for something, that I and my opinions were valid. I have had only good experiences here and count my blessing for the Centre and thank everyone who helped me. All the staff I met throughout my visits were very courteous and friendly. The Centre gives out a feeling of relaxing atmosphere and friendliness. A very caring Centre, it was like having your own family with you. I was so impressed with the Centre and the staff, they make you feel at ease. The surroundings were marvellous, I will recommend it to anyone. I cannot fault any of the advice, help and care I received from all the staff. They have made my life so much better. When I was at my lowest point I found help, support and guidance. Thank you all so much. 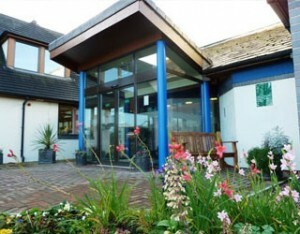 They are all lovely staff and it did me wonders going there and being able to talk and relax with people who care. I now feel I can cope. Your help and care have been wonderful, I feel I can move on with the support of my family and friends. Please come and join us for our next Wellbeing Wednesday on 17th April at 1.30pm. Our monthly Wellbeing Wednesdays take place on the third Wednesday of each month here at the Centre and are open to any Trafford residents affected by cancer. Each session includes a relevant, helpful topic and discussions, followed by the opportunity to mingle and chat with others over a drink. 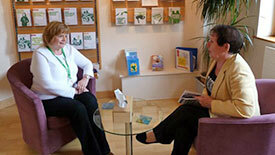 We’ve been awarded the Macmillan Quality Environment Mark at the Macmillan Wellbeing Centre. This award was developed in collaboration with more than 400 people living with cancer, who helped to shape its criteria. The Macmillan QEM recognises that the Macmillan Wellbeing Centre provides a welcoming and comfortable environment for people with cancer. It also acknowledges that we respect our visitors’ privacy, we treat you with dignity and that our facilities will help improve your well-being.